Green Health Barley Grass Hordeum vulgare is high in chlorophyll and contains a wide range of vitamins, minerals, enzymes, amino acids and antioxidants; as well as being a rich source of fibre. This provides a nutrient rich food for sports perple, dieters and others who need more energy. Mix 1-2 teaspoons of Barley Grass Powder into juice, smoothie, salad dressing or other food; build up to twice daily over the first month. Best taken on an empty stomach and ensure six glasses of water daily. Children ½ to 1 teaspoon daily. Contains 100% Certified Organic 200g fine barley grass powder, made from the young shoots of barley grass. Our barley grass is organically grown in a natural environment, without the use of synthetic and artificial chemicals, pesticides or fertilisers. Avoid heating as this will destroy the nutrients. Barley grass, (Hordeum vulgare) is one of the well-known green grasses that are considered to be the most nutritious. The true nutritional benefits are found in the young grass leaves. These leaves are harvested and processed into the final product. The leaves contain many of the vitamins, minerals, and proteins necessary for the human diet. Barley grass is considered a whole food concentrate that is close to its natural state supplying the nutrients we require in a natural proportion. The colour reflects the abundance of chlorophyll and the similarity to other dark leafy vegetables. Eighteen amino acids are found in barley grass. All 8 of the essential amino acids are found in Barley grass. Amino acids are the building blocks of proteins, which are the major constituents of our body and are necessary for the continual cell building, cell regeneration and energy production that are necessary for life. There are high amounts of vitamins and minerals in barley grass leaves. The vitamins found in Barley grass include beta-carotene, folic acid, pantothenic acid, vitamin B1, vitamin B2, vitamin B6 and vitamin C. The minerals include potassium, calcium, magnesium, iron, copper, phosphorus, manganese and zinc. There are many important enzymes found in Barley grass including the antioxidant enzyme, superoxide dismutase (SOD) and the new antioxidant 2”-O-glucosylisovitexin (2”-O-GIV). 2”-O-GIV has been isolated and reported to have antioxidant activity equal to or superior to vitamin E. Barley grass is also rich in chlorophyll content. Barley grass is a whole food providing many essential nutrients that act synergistically together optimising bodily functions. Chlorophyll and other essential nutrients act synergistically in barley grass to detoxify the body from destructive toxins such as heavy metals and pollutants that we digest every day. Chlorophyll also has anti-inflammatory properties. Barley grass can be easily absorbed throughout the digestive tract, giving our body access to vital nutrients. Many of the vitamins, minerals and enzymes present in Barley grass act as powerful antioxidants protecting our body from free radical damage, enhancing our immune system and improving cardiovascular health. 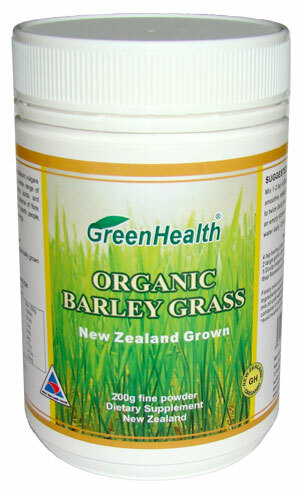 Barley grass is a rich source of dietary fibre which is good for colon health and regularity. Sports people and others who need more energy have used barley grass; it provides them with a nutrient rich food that is also packed with energy. Barley grass is naturally alkaline and it helps to neutralise excess acidity in the body when consumed. Research in Japan and other countries suggest that barley grass powder can be beneficial in asthma, obesity, skin rejuvenation, anaemia, arthritis, gastritis, peptic ulcers, diabetes, cellular damage from x-rays, heart disease and hepatitis.